Excel Airide Compact is highly manoeuvrable and has a tight turning circle. 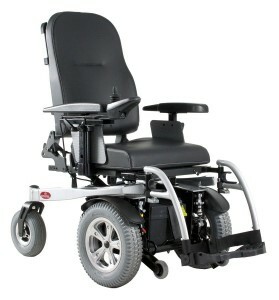 The electric wheelchair has a unique design and portability because the backrest is folded down. Excel Airide Compact is easy to use. The speed is adjustable to increase the driving comfort. The armrests are removable and height, width and depth adjustable. Also, the Excel Airide Compact includes swing-away footrests. The seat depth is adjustable and the backrest is adjustable in four different positions for ultimate comfort. The joystick is swung away to slide on easily at the table. Can be converted as a front wheel drive (FWD) and rear wheel drive (RWD).